The Democratic party met in April 1860, in Charleston, South Carolina. The convention body was split between Northerners, who supported popular sovereignty (the ability of a state to decide itself whether to allow slavery or not,) and Southerners, who wanted the Democratic party to defend the right to hold slaves. The convention refused the Southern demand and the Southern delegates walked out. The Northern members then tried to nominate Stephen Douglas as their nominee. However, with the Southern delegate no longer present they did not have the 2/3 votes needed to select a party nominee. The Democrats met again in Baltimore. Once again the convention deadlocked, and the Southern delegates walked out. The Northerners went ahead and nominated Douglas. The Southerners returned to Charleston and nominated Vice President John Breckinridge to represent the party they now called the “National Democrats”. When the Republicans met in Chicago in May of 1860, William Seward was their front runner to receive their presidential nomination. Seward was the most respected Republican in the country. Delegates, however, were afraid that Sewards' outspoken views against slavery, as well as his attacks against the “Know Nothing Party” could limit the support the party would gain in the election. So the party turned to Abraham Lincoln of Illinois. Lincoln won the nomination on the third ballot. The Republican platform opposed slavery in the territories, but upheld the right of slavery in the South. It also opposed the Dredd-Scott decision. Furthermore, in order to gain support from the former Whigs the Republicans came out in favor of Federal support for national improvements. This included support for the building of the Trans Continental Railroad. A fourth political party was established by those who wanted to preserve slavery, but also preserve the Union. They were called the “Constitutional Union party”. They selected John Bell to be their presidential nominee. 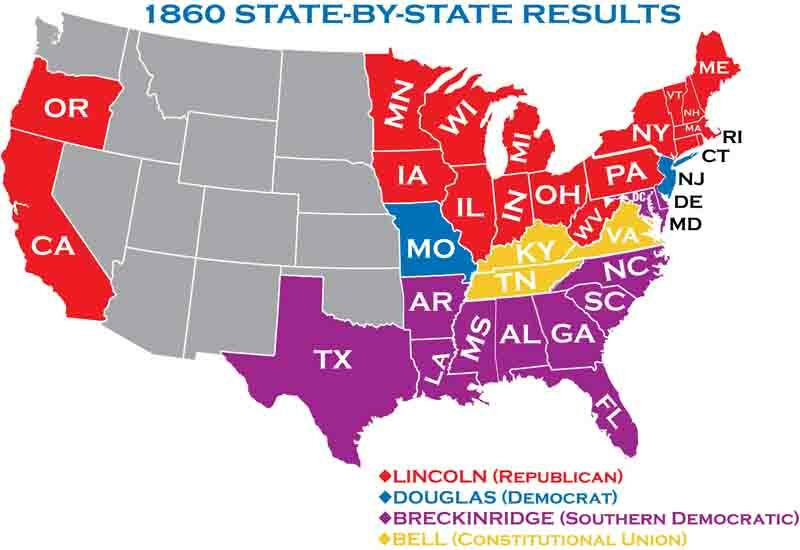 The Republicans were united behind Lincoln, while the other parties were divided by regions. Most of the campaign was implemented by the party organizations. At this time, presidential candidates took a very small part in active campaigning. Stephen Douglas became the first presidential candidate in history to undertake a nationwide speaking tour. He traveled to the South. Douglas did not expect to win many electoral votes in the South. He spoke about the importance of maintaining the Union. 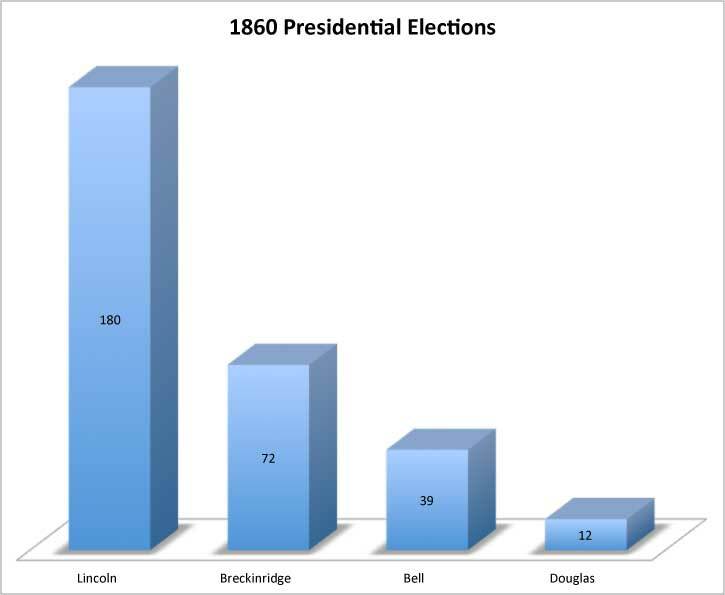 In the 1860 campaign, the presidential contest was in effect two contests. One contest was between Douglas and Lincoln in the North and West. The other contest was between Breckinridge and Bell in the South. The Republicans ran a very vigorous campaign. Their better organization won the day. Lincoln won a clear majority of the electoral vote. He gained 180 electoral votes, versus just 123 for all his opponents combined. 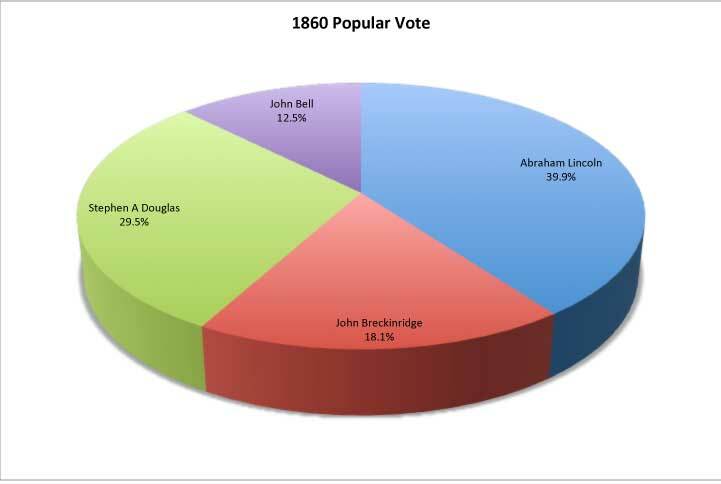 His opponents, however, in aggregate (all together) won a greater percentage of the overall vote, and Lincoln would govern after winning considerably less than half (just 39.9%) of the popular vote.